If you're bummed because your high school garage band never took off the way you had hoped and now you're stuck with a boring career in accounting, look on the bright side: Failing to get signed to a label or make millions may have bought you an extra 2o-some years of life. 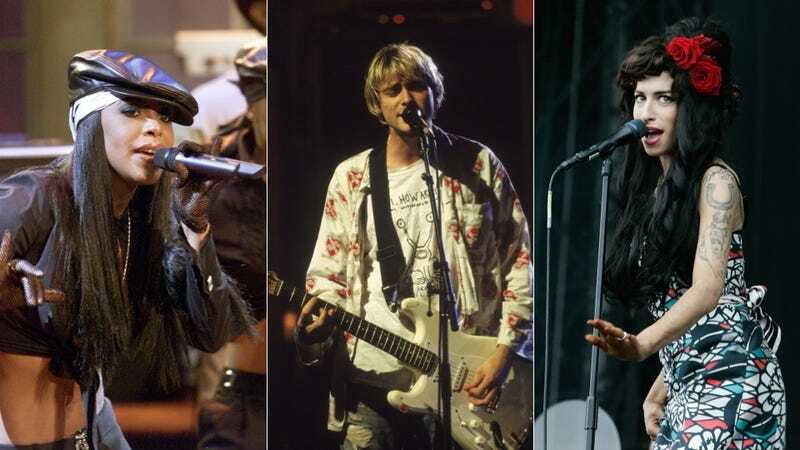 A new study by University of Sydney professor Dianna Kenny has found that, while the 27 club is actually a myth, popular musicians do, on average, die much sooner than non famous people. "The pop music 'scene' fails to provide boundaries and to model and expect acceptable behavior. It actually does the reverse – it valorises outrageous behavior and the acting out of aggressive, sexual and destructive impulses that most of us dare only live out in fantasy," Kenny writes for The Conversation. According to her data, this valorization of destructive behavior leads to a much higher chance of murder, suicide or accidental death. The average age of death for a female pop star, says Kenny, is about 62. The average age of death for women in the general U.S. population is just over 80. The number of accidental deaths and suicides have, according to The Atlantic, been "trending downward. Accidental deaths peaked in the 1960s, while suicides and homicides both peaked during the 1990s." "The music industry needs to consider these findings to discover ways of recognizing and assisting young musicians in distress," Kenny concludes. "At the very least, those who make their livings from these young people need to learn to recognize early signs of emotional distress, crisis, depression and suicidality and to put some support systems in place to provide the necessary assistance and care."